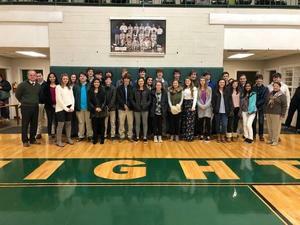 The Greenfield School N.C. YMCA Youth and Government Club is currently in the process of preparing for the upcoming State-wide Convention in Raleigh, Feb. 14th - 17th. At the Convention, club members will be performing a variety of roles, which include voting in the House and the Senate on resolutions and bills, advocating in the Court of Appeals and in Mock Trial forums, analyzing and grading proposals on the floor, lobbying for various groups, and recording information as members of the Media. Pictured are club members: (12th Grade) Patrick Smith – President, Jackson Stone – Vice President, McGuire Metts – Treasurer, Avery Vester – Student Delegation Leader, Safa Ahmed, Catherine Alvarez, Mary Margaret Coats, Teresa Hadley, Sumer Hassan, Riley Jennings, (11th Grade) Hayden McLamb, Tommy Fulghum, Caroline Stone, (10th Grade) Will Powell – Secretary, Margaret Covington, Alex Garner, Amz Hoffner, Ryann Jennings, Cabell Metts, Frankie Peele, William Smith, (9th Grade) Eliza Bryant, Brenner Cobb, Jake Flaherty, Monica Mann, Carter McLamb, Urvi Patel, Jackson Perdue, Dane Reynolds, Gabriel Vester, Cole Wainwright. Club Advisors are Mrs. Katy King, Mr. Seth Penwell, and Mr. Chance Reynolds.